The shooting zone in air hockey is an invisible semicircle just behind the centerline on your side of the table that has the highest percentage to score from. 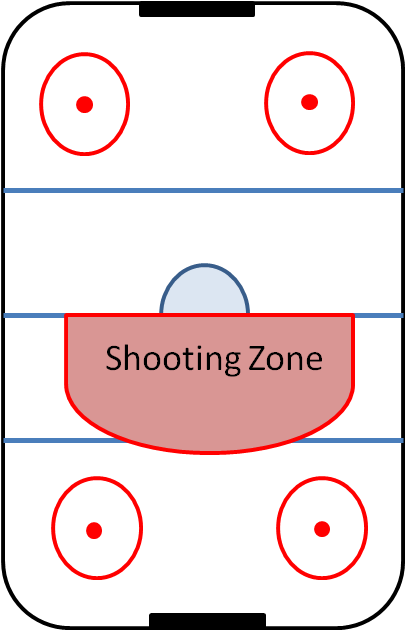 Players that master the game need to learn how to drift the puck into this zone where they will take their shots from. The reason it is so effective is due to the physics and geometry of the table. It is proven by not only the table science but also by the elite players who have mastered the game over the last 30 years. Why is the Shooting Zone so Effective? First, let's cover the physics behind the zone. When it comes to the timing of your shot the shorter the length of time when the puck strikes your mallet to reach the goal the better. The zone allows you to edge closer to their goal, thus reducing the timing. This means your opponent has less time to react to your shot because you are closer to their side of the table. Also, when it comes to the geometry side of the zone, you are allowing your attack to be more accurate because the puck has less distance to travel in order to score. It is just like the old saying goes, "Aim small, miss small." Aiming at a target far away isn't going to help your case as your accuracy decreases and their time to react increases. Should You Take Every Shot From the Zone? The short answer is no. Sure, your highest percentage of shots will come from the shooting zone but that doesn't mean it is the only tool in your toolbox. A good rule of thumb is you should be taking about 90% of your shots from this zone and the remaining 10% should be from outside the zone. That 10% should be comprised of shots that are taken when your opponent isn't quite expecting it or to simply throw in a trick shot to keep you opponent guessing. Air hockey is such a mental game that you can't repeat the same thing over and over with success. Remember that your challenger can easily block straight shots from the zone if they also move forward to cut off your angle on their goal. When you start to see this you can vary up your selection with a bank from inside or outside the zone to catch them off guard. Plus, your opponent needs to be kept on their toes and taking quick shots from outside the zone will add variety to your game so you are less predictable. If you combine that with drifts into the zone to set up your shot, you will be effective.